First published March 15, 2014 , last updated April 3, 2019 . Reading time: 5 minutes. 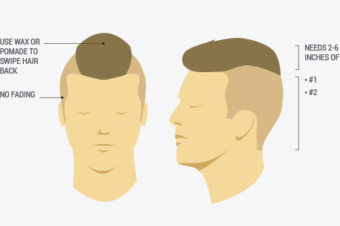 To cut a mohawk, you need somewhat longer hair (it should preferably be more than 1 inch length). Before cutting, decide on how you plan to stylise it – are you going to gel it or let it lay (lazyhawk)? In this case you might prefer doing an undercut instead. You might find it handy to keep a comb near by to help you disentangle and separate the hair, and a pair of scissors for the final trimming and touch up’s. Obviously, you’ll need hair clippers, but that’s about it. First, you need to be very cautious about centring the hair correctly. Start with forming this central part with the help of a comb, and worry about the lower parts later. Use any lower number of guards (for example #2 or #3) to buzz your hair off on each side of the mohawk. This tutorial suggests a very good idea for centring your mohawk – by simply using a piece of masking tape. 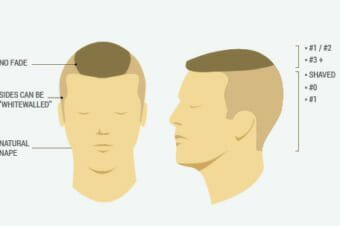 What you need to do is simply stick a long piece of tape on the top of your head, align it until you’re happy with it, and then you’re ready to clip your hair on the sides following these lines. If you’re unsure about your DIY skills, you might want to take your time and start by using a higher number of guards first. This way you are able to cut the sides shorter and shorter as you go. If you’re confident enough about your skills (don’t worry if you’re not there yet, we’ve got your back! ), go ahead with a lower number of guards. Just remember, mohawks demand a lot of precision, so better do it carefully and as slowly as needed for the perfect end result. 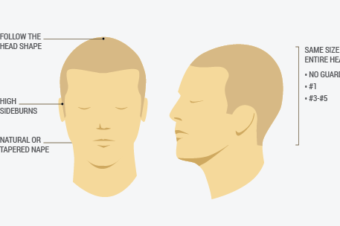 When you got the mohawk about right, use a shorter sized guards to fade your way down to sideburns and back hairline. Depending on the length of the central section of your hair, you might want to trim it too. Do this with a pair of scissors rather than using clippers after you clipped the sides. This will prevent you from cutting too much and eliminating the contrast between the central section and the sides. How do I make my mohawk stand up? 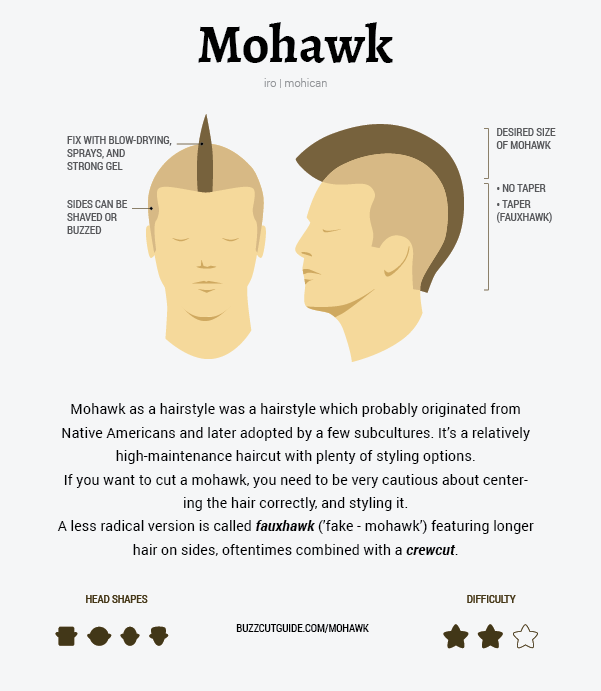 People use gel, spray, blow dryer, or even starch or sugar to make their mohawk stand up. The best option for you will depend on your hair type. If your hair is thick, curly and/or dry, pomade or wax might suit you better than gel or spray that tend to dry hair. When you’re done with clipping and trimming, wash your (remaining) hair. While it’s still wet, put your head upside down and blow-dry it. This will add more volume to the central section. Then, while still standing with your head between your legs, apply your favourite stylising product. Depending on the length, use (a lot of) hairspray and let it dry like that for a while. THEN you may lift your head back up and you’re ready to rock that mohawk. How to dye my mohawk? If you’re going to dye your mohawk after cutting your hair make sure you don’t wash your hair afterwards and don’t use any stylising product just yet, as you’ll want your hair to absorb more colour pigment. If you’re choosing a fantasy colour (e.g. purple or green), or if you’re going for a light blonde, you will need to bleach your hair first by mixing bleach powder and developer (peroxide). Mix the bleach powder and the developer in a plastic bowl until the mix has a yogurt consistency, put on some gloves, and spread the product on your hair with the help of a tint brush. Make sure you don’t let the bleach sit for too long, so that you don’t burn your scalp! If you’re not used to bleaching stick with a lower developer volume for the first times. Since the roots of your hair bleach much faster, you might be done with bleaching in 10-15 minutes. After this, wash out your hair carefully and you’re ready to apply the dye. Fantasy colours like the ones of Manic Panic don’t damage your hair. Actually, they are extra gentle to your hair since they are completely vegan. Let it sit for a while and check in regularly until the desired colour. Wash out your hair again and apply conditioner or a hair mask. After drying your hair with a towel and/or blow drying it, you are ready to stylise your hair by following the instructions above.